+++ OMNiPRESENCE +++ LAST SHOW EVER!!! beautyfull chillout on the river spree!!! Welcome to Indoor Session.We are proud to present this meeting of darkness in our beautiful Berlin City. Cerebral Chaos & Kazulu Head of Cerebral Chaos celebrating their birthday and bring some deep psychedelics to the party. We give you one real trip into psychedelics with 5h of Sectio Aurea and more. 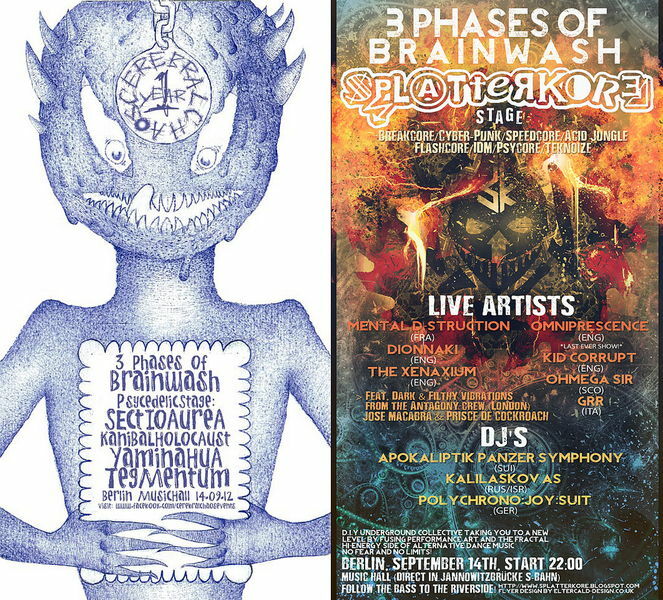 On the Splatterkore-Floor you should fasten your seatbelt and make yourself ready for some crazy geniuses of the breakcore/flashcore/jungle family who really know how to "core" your mind. If you think you can escape to the the chillout and relax your groggy brain you're definitely wrong...you will be surprised how wicked this one is able to become if the right brain-puppeteers playing the "chillout". - VEGI FOOD + by dkcin? - ENGERY BALL´S + by dkcin? - TRANCEDENTALE BOOK´S FROM INDIA + by dkcin? PLEASE HELP TO KEEP OUR PARTYCULTURE...STOP GEMA!!!! Direkt im S-Bahnhof Jannowitzbrücke (Spreeseite). Leave the station to the left, go down the stairs to the left, then enter to the left.